The F.D Rich Company has a rich history of urban renewal that is at the heart of every project we develop. 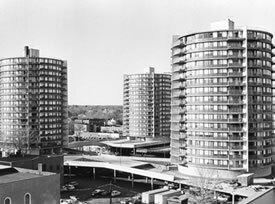 In 1960, from a field of 10 competitors, the nationally active, locally based F. D. Rich Company was selected to be the sole redeveloper for downtown Stamford’s ambitious, billion-dollar, 130-acre urban renewal project. The development site covered the core of the City and required the relocation of 1,100 families and 400 businesses. $100 million dollars of Federal, State and City funds were invested in launching the massive renewal effort. The Rich Company commissioned renowned city planner Victor Gruen & Associates to create a comprehensive plan to return Stamford’s historic center to the vital heart of the City. Robert N. Rich was appointed president of the Stamford New Urban Corporation, a wholly owned Rich subsidiary and, with Lawrence Gochberg, Company General Counsel, directed the activities that would transform Stamford from an eroding industrial city into a magnet for blue chip international corporations and world class arts, education and health care institutions. In the early 1970’s, taking advantage of the movement of corporations from New York City, the Company began to construct a series of office buildings, eventually totaling 18 buildings comprising more than five million square feet of space. 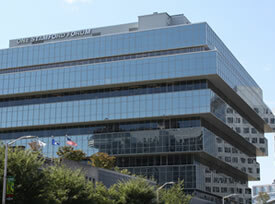 Ahead of its time, the Company selected internationally renowned architects to design most of its buildings including the boldly sculptured One Landmark Square, which became the tallest structure between New York City and Boston, Massachusetts, and the distinctive inverted glass pyramid positioned along I-95, which became the 500,000 square foot world headquarters for GTE. The renewal effort resulted in Stamford being, for a time, home to the third largest concentration of Fortune 500 companies in the country. During the 1970’s and 1980’s, F.D. 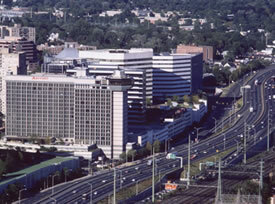 Rich added the Marriott Hotel, then the largest hotel in Connecticut, and, with the Taubman Company, developed, the 1 million square foot 130 store, Stamford Town Center Mall, and a number of residential buildings. The Company also played a major role in bringing arts and education to the downtown with financial contributions and through efforts of Frank D. Rich, Jr. (d. 2007) who was the founder of the Stamford Center for the Arts. 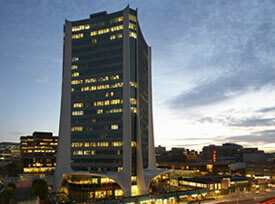 During his 19-year tenure as member of the Board of Trustees of the University of Connecticut, Mr. Rich worked with others to establish a branch of the University in downtown Stamford. After more than a century of commitment and almost 50 years of urban renewal, Stamford has emerged as an internationally renowned center and one of the most economically vital downtowns in the State of Connecticut. 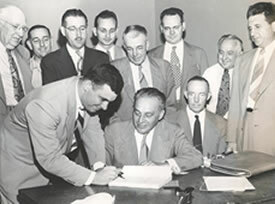 As the Company looks back with pride in its accomplishments, it remains as committed to the advancement of Stamford as it was upon the signing of the original Urban Renewal contract. © 2019 F. D. Rich Company.